I’ve been waiting for a proper Chinese cover or rendition of Gangnam style for a while now. Thanks to the cool reddit community, r/China, I’ve found it. It’s set in Beijing with Laowai, Jesse Appell, who’s studying at Tsinghua University. I was skeptic at first, but then the video proved me wrong. It’s fun, it’s clever and definitely Laowai style! Well you can watch and tell me yourself. It has over 180,000 views on Youku. Youtube video also below. The Chinese is quite easy to follow, with lines like “每天吃中国菜不会用勺吃的老外”. You’ll notice that lyrics follow a similar construction “…….的老外”. Greg from Mandarin Segments, explains these constructions quite well. Yeah, the singing might not be entirely on key at parts, but who cares!? 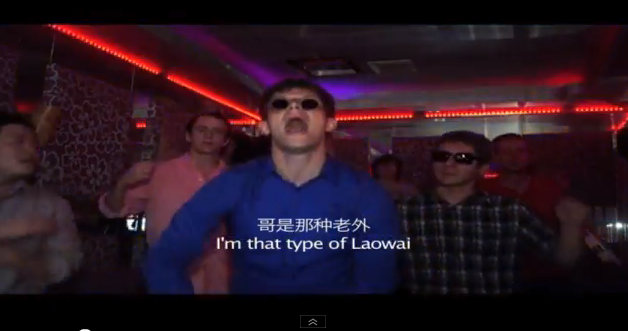 It’s Laowai style! Check out Feichang Fresh too for some more Laowai hitting it up in Beijing.